Business roots seem to run deep in Eddie Spencer's family. Born in New York, his family moved to the Midwest and he currently resides in Wichita, Kansas. His heritage goes back to the pioneer days when his early relatives were entrepreneurs. His grandparents developed a new marketing innovation; a self-serve grocery store. Instead of relying on the grocer to pick the products off the shelf, the buyer would do it. We take this concept for granted now, but back then, it was a cutting edge business idea. Eddie age 4 - dreaming of teddy bears and chocolate cakes! 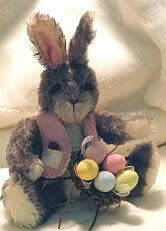 See the Chocoholic's Recipe section and make Eddie's family cake. 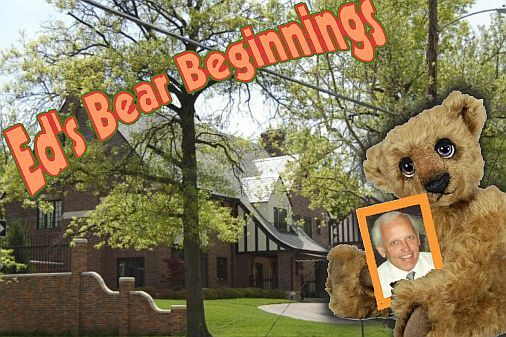 Eddie's beginnings in bear making started in 1969 when his mother bought a bear kit, opened the package and saw how big the bear was going to be. Her interest was in miniatures, so she put the kit away. 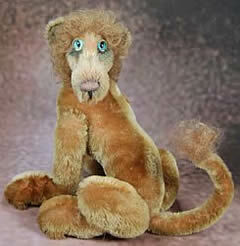 Eddie retrieved the kit months later, cut out the pattern, and sewed it together by hand. 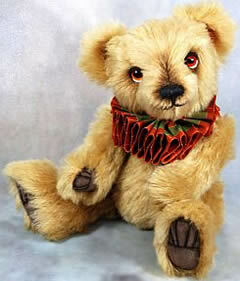 He stuffed the bear with wood shavings that were included in the kit and put the finishing touches on it. 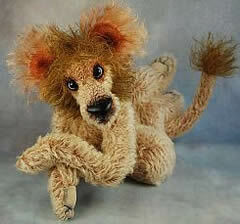 "Let's just say it was the beginning and end of my bear-making career for the time being," Eddie recalled. Aiding his mother with her miniature diorama making, Eddie began sculpting dolls to add to her scenes. "She bought molds for making porcelain doll-house dolls and away we went!" Eddie remembers fondly. 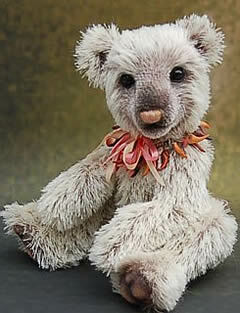 "I used to cast the molds, do the cleaning and firing, later started painting and honed my skills. We entered the D.A.G. 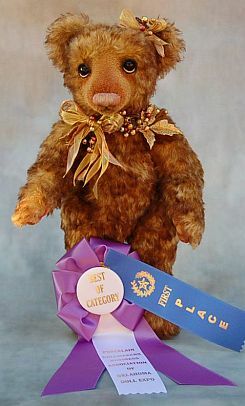 competition in the early 1980's several times and eventually won the "MILLIE"; the top honor in the doll making scene at that time." 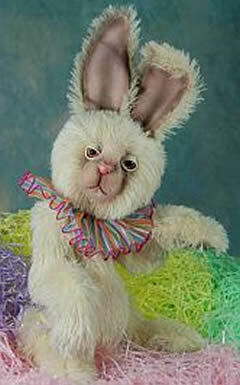 From that success, they started a doll making studio in Wichita, Ks. named Sunday's Child. During Eddies 'doll days', he continued sculpting and even studied at the Kansas City Art Institute. 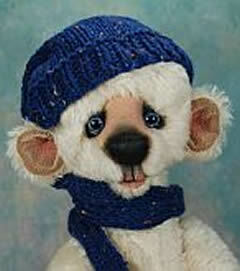 In 2003, feeling burned out with doll making, he bought a copy of a teddy bear magazine. Inspired by the artists he saw gracing the pages, he began researching on the Internet. He called a friend and former business partner, Pat Jones. 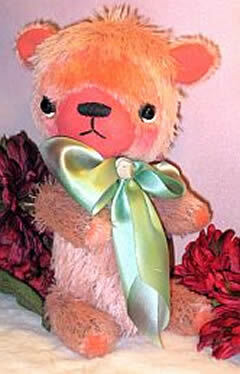 "She carried a few bear making supplies and I found out from Pat where to order mohair." Eddie said smiling, "I was off and running, making a bear." 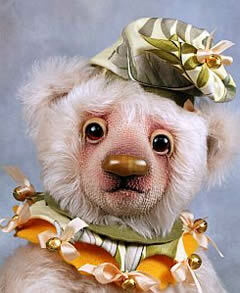 "The first bears were at best, "awful". I gave them away as quickly as possible and hope now that they never resurface!" Working as a specialist for FedEx now, Eddie will retire in June of this year. His retirement will then be filled with increased production of his creations. 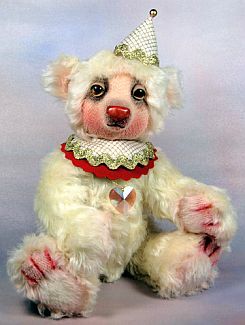 After rekindling his love of bear-making, he either makes the teddy bears from his own original designs or uses a commercial pattern which he modifies to suit a specific project or 'look' that he is striving accomplish. "When I was sculpting doll heads commercially, the eyes were my favorite part of the face." Still intrigued by the eyes, this feature has become his forte. 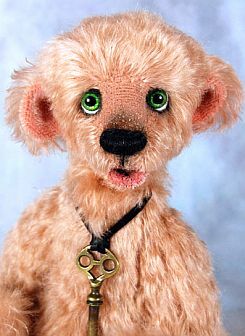 "I use all sorts of materials to shape eyelids, some even open and close to make the bear stare back and come to life." The eyes have become his trademark. 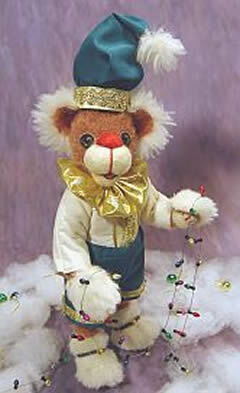 Preferring to sell his bears on his web site, Eddie does participate in a few teddy bear shows through the year. 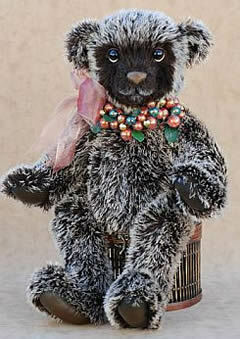 After retiring in June, he hopes that traveling and selling his bears "will continue to be rewarding both emotionally and financially," Eddie says with a twinkle in his eyes. 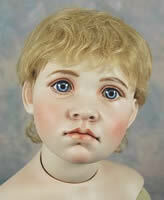 One of the fine porcelain dolls Ed creates with emphasis on the eyes.